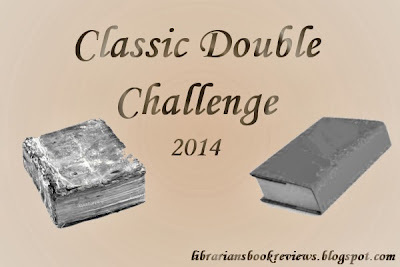 One Librarian's Book Reviews: Classic Double Challenge, 2014: Sign Up! Classic Double Challenge, 2014: Sign Up! I'm so excited to bring back the Classic Double Challenge for another year! Despite my spotty at best blogging of late, I wanted to do this challenge again for any of you looking for motivation to read a retelling or classic. I love the idea of new retellings bringing love to our old favorites. By "classics" I'm being very loose in my definition, as this challenge lets you read fairy tales, mythologies, classics, any kind of original story to compare with a retelling. Also "retelling" is pretty loose too - the original and the newer book have to relate in some way that you can define; it doesn't have to be a straight-forward retelling. Hopefully these definitions allow you the wiggle room needed to find something to fit your fancy. The first is kind of a "classic" and in the second, the main character loves A Wrinkle in Time and it plays a part in the plot, but this is not a retelling. So, you can see there are lots of options for you. If you need some inspiration for retellings, I've compiled a rather extensive list of retellings. I have another list for fairy tale retellings. Also, during the Retell Me a Story celebration next month I will be highlighting some newer retellings that have been released or are coming out soon. Once you decide on your level of participation, post your pledge on your blog/tumblr/goodreads/in the comments and maybe give us some possibilities of what you want to read (obviously, these aren't set in stone). When you complete a pair, feel free to write reviews/reactions/comparisons/whathaveyou about the books and I'll have a monthly link up here to share our progress. Thanks for hosting this one, again! Please consider creating a Facebook page for your blog. I would like to "save" it on Facebook so that I remember to come back here.